When the light is just right, these tiny tree leaves take on a feathery look. These trees (name ?) are in my neighbor's yard. Hummingbirds seem attracted to these trees too. Thanks for stopping by. Beautiful textures and tones, you certainly found the right light for this shot. Lovely detail and back lighting. Lovely close up shot with great details. Lovely softness, and the shape makes me think of a ballerina's skirt! They're maples, right? We had the same little "helicopters" on the trees in my north Seattle yard growing up. Love the lighting. A great sharp crisp shot. 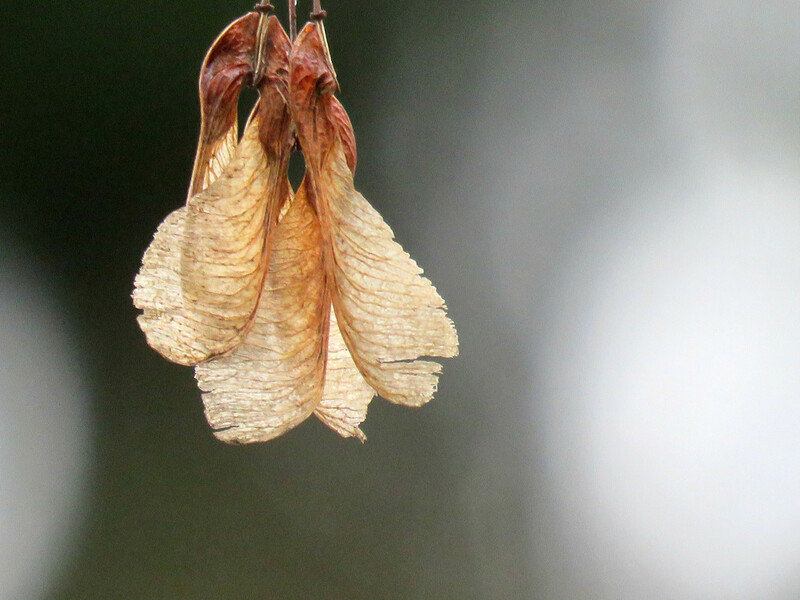 yes they do seem more like spent seed pods - stunning image! They ressemble sycamore wings which have helicopter behaviour in so far as they spin when falling from the host tree. Delightful! Lovely macros. Great textures, subtle colors. Congratulations on PP and TP!